Saturday 8 October (7pm) art collective Liberate Tate with The Guerrilla Girls will challenge Tate to never again partner with any fossil fuel company after its controversial relationship with BP ends in early 2017. Liberate Tate, who carried out a six-year long series of unsanctioned art interventions in Tate galleries over BP sponsorship, will issue the challenge at Tate Modern from the Guerilla Girls’ Complaints Department in the new Switch House building. In this installation, individuals and organisations are invited to post complaints about art, politics, the environment or other issues they care about. Tate will be called upon to make the Fossil Funds Free commitment: a promise to not take any oil, coal, or gas corporate sponsorship. Already hundreds of institutions and artists, including some exhibited at Tate, are signed up to be Fossil Funds Free. The commitment is coordinated by Platform London, who will also be at Tate on Saturday. The Fossil Funds Free commitment is so far made by 400 artists, performers, and cultural organisations from around the world. They refuse their work to be used to justify and promote dangerous fossil fuel extraction. By creating an oil-free cultural sector, this movement is enabling the transition to a liveable future without fossil fuels. You can complain about other stuff too whilst you are there, join Fossil Funds Free, and/or call on Tate to do so! Liberate Tate (www.liberatetate.org.uk @liberatetate) is an art collective that has been exploring the role of creative intervention in social change by making unsanctioned Live Art in Tate gallery spaces since 2010. With an aim to free art from oil, Liberate Tate initially focused on Tate ending its sponsorship deal with BP, and in March 2016 Tate announced that from 2017 it would no longer receive funding from BP. 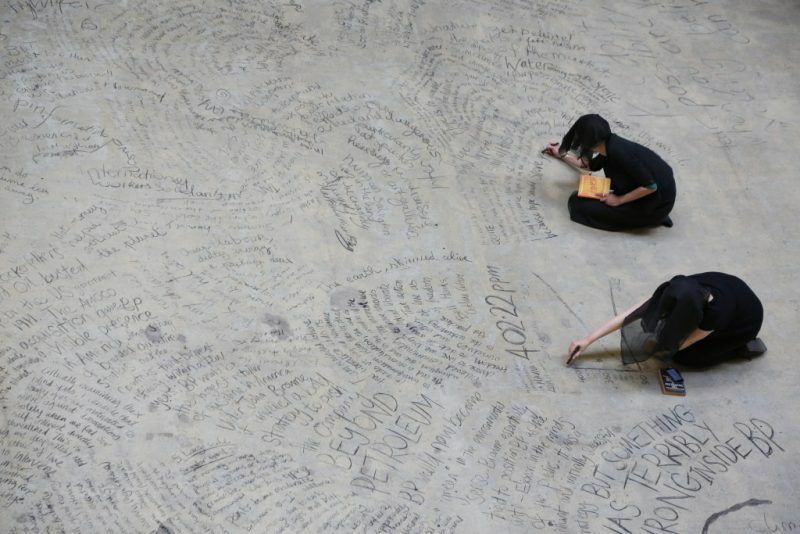 Liberate Tate performances have ranged from installing a 16.5m wind turbine blade in the Tate Modern Turbine Hall to occupying the gallery overnight in a durational performance transcribing texts in charcoal onto the floor. The Fossil Funds Free commitment is coordinated by Platform (www.platformlondon.org, @PlatformLondon) with support from Liberate Tate as well as the Art Not Oil Coalition (UK), Not An Alternative (US), The Natural History Museum (US), BP Or Not BP? (UK), and Stopp oljesponsing av norsk kulturliv (Norway). BP sponsorship of Tate lasted just over 26 years. In February 2017 BP will be gone from Tate with the end of the present contract. In July 2017 former BP CEO John Browne leaves as Tate’s Board Chair. Liberate Tate are also calling for the incoming Chair to have no ties to fossil fuels extraction, as Browne still has, such that Tate’s damaged reputation with artists and the climate-conscious public can be repaired from the poor judgements of the past and Tate can be part of the climate solution not part of the problem.